Altec Lansing launches budget USB-powered desktop speakers | What Hi-Fi? 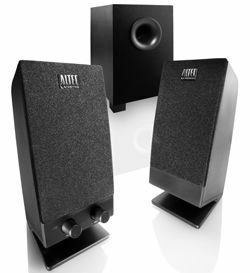 If you're looking for an affordable way to improve the sound from your laptop or computer, then here are two suggestions from Altec Lansing. The BXR1320 features a pair of compact speakers with 2in full-range drivers. Powered by USB, simply plug and play to hear them in action. For a bit more bass for your buck, you can add a subwoofer. The BXR1321 is a 2.1 system thanks to the addition of a 4in downward firing bass driver. The speakers will be out in mid-May from Amazon, Currys, PC World and others, with the BXR1320 at around £20 and the BXR1321 at £35.